Have you ever boycotted a product or a company? If so, what fueled your decision? A recent survey of American consumers says the number one reason does not involve a company’s stance on unions or an environmental accident or even a possible health risk from a product. The number one reason Americans will boycott a company — politics. 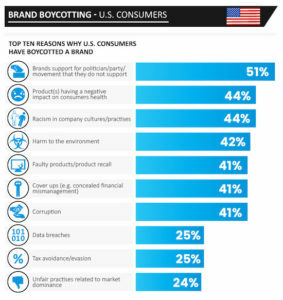 51% of survey respondents say their reason for boycotting a company or a product are tied to a company’s affiliation with a political party or a movement. Two issues tied for second place with 44% saying they avoid products that have a negative impact on our overall health as well as those companies with a bad record on racism or exhibit racist policies. Friday, Mike Opelka spoke with supermarket guru Phil Lempert about the survey’s results. Listen to Opelka’s interview with Lempert. Follow Mike Opelka on Twiwtter — @stuntbrain.